Father's Day Gift Idea: Jack Ryan Blu-Ray Combo for only $12.96 at Walmart with $15 Ticketmaster Bonus | A Savings WOW! Are you still looking for a great gift for dad this Father’s Day? One creative gift idea is to give him a movie-themed gift basket. All you’ll need is a basket, popcorn, theater box candy, and of course, movies! Well, a set of movies he will love are the Jack Ryan movies. Starting on Tuesday, June 10th, visit your local Walmart store for their exclusive Blu-Ray DVD release of Jack Ryan: Shadow Recruit for $12.96. 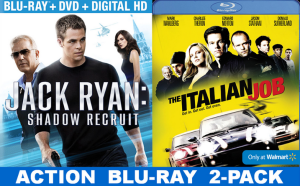 This Walmart Exclusive pack includes both Jack Ryan: Shadow Recruit and The Italian Job. BONUS: You’ll also get $15 off sports tickets at Ticketmaster (this offer is valid Tuesday, June 10th through Saturday, June 14th only). The best part is that you are giving him the gift that keeps on giving. He can have a movie night whenever he would like without the movie theater cost. He’ll get two great movies and $15 off sports tickets, all for one very low price!